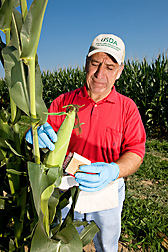 In Stoneville, Mississippi, plant pathologist Hamed Abbas uses the pin-bar inoculation technique to evaluate the colonization of corn by the biological control agent K49. Aspergillus flavus and A. parasiticus are naturally occurring soil fungi that are capable of invading food and feed crops and contaminating them with aflatoxin. Aflatoxin is a human carcinogen produced by the fungi and is also toxic to pets, livestock, and wildlife. In addition to the safety hazard posed by aflatoxin contamination, the fungi place a significant economic burden on food and feed industries to ensure that contaminated products are prevented from reaching the food and feed supply. Agricultural Research Service (ARS) researchers in Georgia, Mississippi, and Louisiana are looking at different approaches for control of aflatoxincontamination: One is “competitive exclusion”—using benign strains to impede colonization by harmful strains—and the other is developing corn germplasm that resists buildup of aflatoxin. Recently retired microbiologist Joe Dorner at the National Peanut Research Laboratory in Dawson, Georgia, helped develop Afla-Guard, a biological control for A. flavus and A. parasiticus in peanuts. Afla-Guard is composed of hulled barley coated with spores of a nontoxic strain of A. flavus. The nontoxic Aspergillus fungi successfully compete against the toxic species for the limited space and nutrients each needs to grow and thrive. In peanuts, Afla-Guard reduced aflatoxin by an average of 85 percent in farmers’ stock peanuts and up to 97 percent in shelled, edible-grade peanuts. 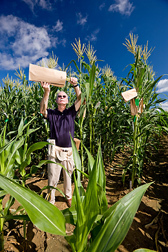 In Starkville, Mississippi, geneticist Paul Williams places bags over the tassels of corn plants with the desired molecular markers to collect pollen. In light of this success, Dorner and other ARS scientists conducted a 2-year study of Afla-Guard in corn. They again found that it was effective in reducing aflatoxin levels—showing an overall reduction of 85 percent, when compared to the levels found in control fields. Afla-Guard was applied to the corn crop in different ways: to soil when corn was less than a meter tall, in plant whorls prior to tassel formation, and as multiple sprays during silking. ARS scientists in Stoneville, Mississippi, are also using competitive exclusion to manage aflatoxinin corn. Their studies use a benign Aspergillus strain dubbed “K49” to outcompete the harmful fungi. 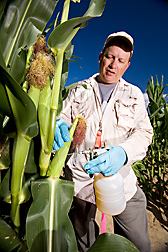 In 4 years of field trials, K49 applications to corn reduced aflatoxin by 60 to 94 percent. 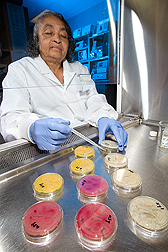 At Starkville, molecular geneticist Marilyn Warburton harvests leaf matter for DNA genotyping. The goal is to identify plants with markers for resistance to Aspergillus flavus and aflatoxin accumulation. To understand how K49 colonizes corn kernels, ARS plant pathologist Hamed Abbas used the pin-bar inoculation technique of applying the treatment. In this method, small finishing nails embedded in a wooden dowel are dipped in a K49 spore suspension and then used to penetrate corn husks in order to inoculate the kernels inside with the beneficial strain. Other early research on competitive exclusion in cotton was done by ARS plant pathologist Peter Cotty, formerly in the ARS Food and Feed Safety Research Unit in New Orleans and now at the unit’s Tucson, Arizona, worksite. In 1996, ARS was awarded EPA approval to test one Aspergillus formulation, named “AF36,” in commercial cotton fields in Arizona. Successful testing paved the way for additional approvals and uses. EPA registration for use of AF36 on corn is pending. “The presence of aflatoxin in corn grain greatly reduces its value and marketability,” says ARS geneticist Paul Williams, who has worked on identifying and developing corn germplasm lines with genetic resistance to A. flavus infection and the subsequent accumulation of aflatoxin. Corn, in particular, has been hit hard by aflatoxin, with annual losses to the corn industry estimated at $192 million. Williams, who is in the ARS Corn Host Plant Resistance Research Unit (CHPRRU) at Mississippi State, leads a multidisciplinary research team of five ARS scientists located at Mississippi State University and works with other university and ARS collaborators from several states. Williams and his scientific team have developed and released germplasm lines that exhibit the highest known levels of resistance to A. flavus. In field trials conducted in Mississippi in 2008 and 2009, mean aflatoxin accumulation was about 95 percent lower in the hybrids produced by crossing the ARS-developed germplasm lines than in a group of commercial hybrids adapted to Mississippi. In the 2008 field trials, germplasm lines Mp715 and Mp717 exhibited the highest levels of resistance to aflatoxin contamination. In 2009 the recently developed germplasm line Mp04:097 performed well in the trials: Hybrids produced by crossing Mp04:097 with other resistant lines exhibited the lowest levels of aflatoxin accumulation. Williams, geneticist Marilyn Warburton, and plant pathologist Gary Windham are also mapping quantitative trait loci (QTLs) associated with resistance to aflatoxin accumulation in crosses between resistant lines (Mp715 and Mp717) and susceptible lines with good agronomic qualities. Their goal is to identify linked markers that can be used in marker-assisted breeding. Geneticist Matthew Krakowsky, in the ARS Plant Science Research Unit, Raleigh, North Carolina, has cooperated in these investigations. In Stoneville, Mississippi, biologist Bobbie Johnson adds ammonium hydroxide to Aspergillus cultures to differentiate aflatoxin-producing strains (yellow and red) from nonproducers (off-white). The research team also found that the Mp715 and Mp717 lines are resistant not only to aflatoxin accumulation, but also to fumonisin accumulation. Fumonisin, like aflatoxin, is a mycotoxin—a toxic metabolite—and is produced by F. verticillioides. The toxin causes neurologic abnormalities in horses—such as weakness of the face and pharyngeal muscles, facial desensitization, and a tendency to lean to one side—after they’ve consumed infected corn. “These lines should be useful in developing corn lines and hybrids with resistance to both fumonisin and aflatoxin accumulation in grain,” says Williams. The lines have been widely requested and used in plant breeding programs in state, federal, and international research institutions plus three major commercial seed corn companies and several smaller companies. The CHPRRU scientists have also developed and released corn germplasm lines with resistance to fall armyworm and southwestern corn borer, thus reducing the devastating leaf feeding by the two pests. Williams, along with CHPRRU agronomist Paul Buckley, tested 20 single-cross corn hybrids in laboratory bioassays: Larvae of both fall armyworm and southwestern corn borer weighed significantly less when fed the ARS-developed corn leaf tissue than when fed the susceptible hybrids. The CHPRRU scientists have demonstrated that growing hybrids that sustain less damage from such ear-feeding insects as fall armyworm, southwestern corn borer, and corn earworm results in reduced aflatoxin contamination. 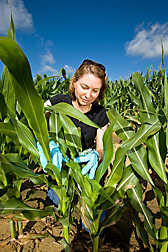 Molecular geneticist Marilyn Warburton and geneticist Paul Williams tag corn plants identified in the lab as having molecular markers associated with resistance to Aspergillus flavus and aflatoxin accumulation. These tagged plants will be crossed with other breeding lines to develop resistant corn hybrids. In related research, by comparing aflatoxin-susceptible with aflatoxin-resistant corn lines (some developed by Williams), ARS plant pathologist Robert Brown in New Orleans identified and characterized a number of proteins that may be important in imparting resistance to corn. (See “Hardy New Corn Lines Resist Toxic Fungi,” Agricultural Research, Oct. 2009, p. 14.) In the collaboration with Warburton mentioned above, the genes for these proteins have been mapped to chromosomal regions containing QTLs previously linked to aflatoxin resistance in the corn genome. These specific resistance-associated proteins can serve as targets for the marker-assisted breeding being carried out in Mississippi. Expanding our horizons in corn breeding, Brown, with financial support from the USDA Foreign Agricultural Service, the United States Agency for International Development, and the ARS Office of International Programs, established a collaborative breeding program with the International Institute of Tropical Agriculture in Ibadan, Nigeria, which recently released six aflatoxin-resistant corn lines. These lines, the product of up to 10 generations of selection and inbreeding, have passed quarantine and are now available in the United States from the ARS North Central Regional Plant Introduction Station, Ames, Iowa.—By Sharon Durham and Jan Suszkiw, Agricultural Research Service Information Staff and Alfredo Flores, formerly with ARS. 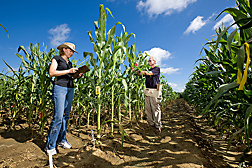 This research is part of Food Safety (#108), Plant Genetic Resources, Genomics, and Genetic Improvement (#301), Plant Diseases (#303), and Crop Production (#305), four ARS national programs described at www.nps.ars.usda.gov. To reach scientists mentioned in this story, contact Sharon Durham, USDA-ARS Information Staff, 5601 Sunnyside Ave., Beltsville, MD 20705-5129; (301) 504-1611.